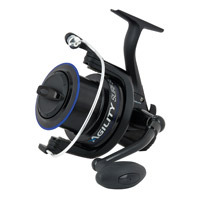 Dedicated surf reels that fit into the Agility family of front drag reels. These attractive looking, saltwater protected surf reels have long cast, large capacity spools and hit a key price point for Shakespeare in the saltwater market.  Smooth / Strong drag system.  Saltwater protected  corrosion resistant.  Supplied with spare graphite spool.